Let's start with a quote from the biography, because to me it's very recognizable (I have a musical project of my own for the exact same reasons): "The idea for Ministry of Truth started a couple of years ago when I felt that the world and the times we live in no longer made sense. So this is my saftey valve to be able to handle a world that feels and seems more and more bizarre and Kafkaesque every year. A way to cope with the ever faster approaching dystopian future". Music is indeed a perfect vavle to deal with feelings like these. Many people from around the world are using music to express themselves and to escape from the badly written soap-series life has become. 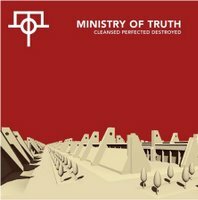 Ministry Of Truth is a one-man post-rock project from Umeå, Sweden. This EP is his debut and judging from the three excellent tracks, it's a very promising one. Opener 'Solitude In Numbers' is a long progressive post-rock track that says a lot without using words. It reminds me a bit of Explosions In The Sky. The build-up is a bit similar but two aspects make it different from most post-rock I've heard. First is the progressive rock guitar solo, something I don't hear very often. Second is the fact that by the end the track gets a bit experimental, loosing the typical post-rock touch. Yet, that's ok. I love it. 'A Billion Faces All As One' incorporates basically the same elements. This is my favorite track on the album. With a perfect, cold atmosphere Ministry Of Truth combines typical post-rock with the dark sounds of a band like Tiamat. Halfway through, the song gets heavier and more intense. 'Cleansed Perfected Destroyed' closes this EP in style. The tempo goes up a bit, reinforced by some dreamy guitars. Yet, here too, the Tiamat reference isn't far away and makes this an extremely enjoyable instrumental song.